It is not often that one creates a graph using actual data and discovers an almost perfect linear relationship. It is even more rare to have a software package calculate the least-squares trend line and obtain a correlation coefficient, R-squared, of 0.99 or higher. Yet, that is exactly what occurred for data from calendar year 2014 for US residential electricity consumption per customer, and average price per kWh. The graph and simple statistics are shown below, then a discussion. Note the R-squared value of 0.9997, indicating an almost perfect correlation. 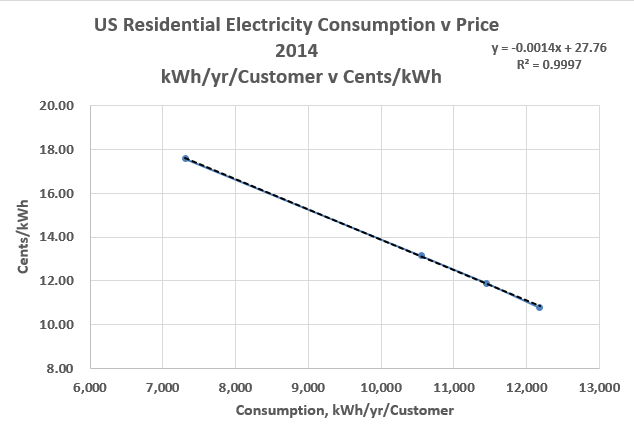 This article follows another SLB article (see link) that ascribes the relatively higher price for residential electricity in California compared to the US average to mild climate and large population. Conventional wisdom is very wrong in blaming solar power and wind power for the higher California prices. With the data ready at hand from US Energy Information Agency files from their website, it was a simple matter to sort the data for each state by annual average residential price in cents/kWh. Being previously aware that low residential prices tend to correspond to high consumption, and vice-versa, inspection of the data for 2014 confirmed that relationship. However, when the data is grouped into quintiles, a convenient grouping as there are 50 US states with ten members in each quintile, an almost perfect straight line resulted, as shown in Figure 1 above. However, there are only four data points in Figure 1. The R-squared of 0.9997 resulted when only the four quintiles with highest prices are graphed, that is, the quintile with lowest prices was excluded. Also, Hawaii is excluded as a high-priced outlier. More on that in a moment. The data for each quintile is shown in table form below. Next is shown in Figure 2 the graph of all five quintiles for 49 states - Hawaii is excluded as being a-typical and an outlier. This graph has only a slightly lower correlation coefficient, R-squared of 0.9931. 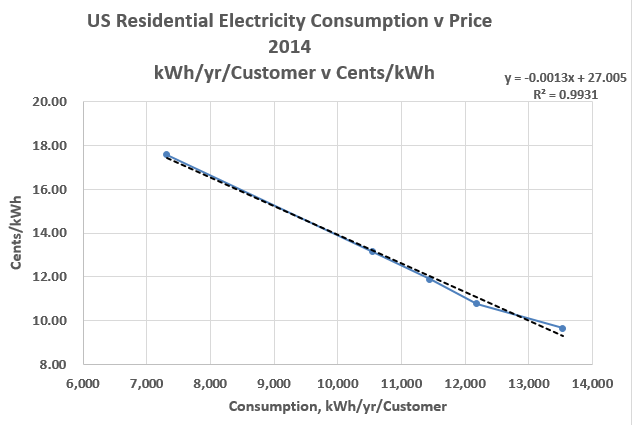 The conclusion that can be drawn is that there is indeed a correlation, and a very good correlation, between average price for residential electricity and the quantity of electricity consumed on an annual basis by each utility customer. 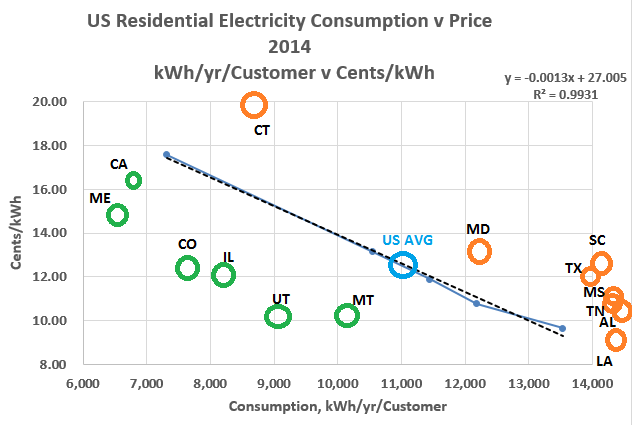 California is in the fifth quintile for high price but low consumption (16.2 cents/kWh and 6,741 kWh/yr/customer). Other states with California in the fifth quintile are almost all in the North East sector, Massachusetts, Vermont, Rhode Island, New York, Maine, New Jersey, and Connecticut. Example states at the other extreme, in the first quintile are Louisiana, Arkansas, and Oklahoma - all hot, humid, and consuming 14,000 kWh/yr/customer on average, more than double that of California. In fairness, it should be noted that the high correlation coefficient only results when the quintiles are graphed. For all 49 states individually, again excluding Hawaii as an outlier, a much lower correlation coefficient results, of R-squared 0.546.